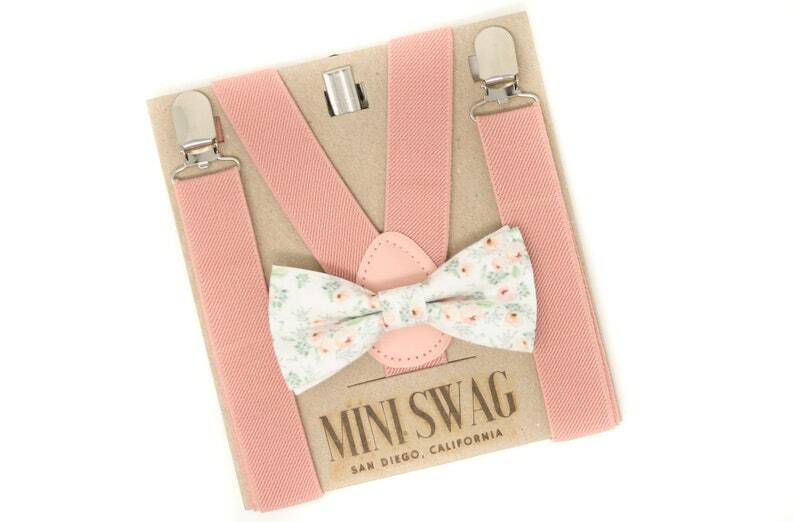 Your little one will be the talk of the party when he arrives sporting this beautiful white and blush floral bow tie & coordinating blush pink suspenders! Perfect for a ring bearer or page boy outfit, groomsmen, parties, cake smash or family photo shoot! The 100% cotton bow tie features flowers in shades blush pink, sage, and gray. The kids bow ties come in 2 attachment options- on an alligator clip (best for squirmy little guys) or an adjustable elastic neckband (best for older kids). See images. Adult bow ties come on an adjustable fabric neckband.